For your term project, you are expected to design and implement a relational database to meet the requirements described in the PCI Warranty Call Center Case. 1. A conceptual ER model/diagram of PCI’s data requirements. The diagram should include all relevant entities, attributes and relationships. For each entity, specify the identifier (primary key). Specify relationship names and cardinality constraints. Indicate which attributes are required, composite, multi- valued, and/or derived (Note: by default, an attribute is assumed to be optional, simple, single-valued and not derived). Indicate which entities are associative. Follow consistent naming conventions for entities and attributes. Use modeling/diagramming software to create the ER Diagram. 2. A list of the normalized relations (the logical model) and their attributes. For each relation, primary and foreign keys should be clearly indicated. Note: Use the format that we will be discussing in class for presenting your logical model. 3. A list of assumptions (if any) made about the information requirements presented in the case. Note: the assumptions should be reasonable and should not contradict the facts of the case. 4. A data dictionary that defines the metadata for the logical model. 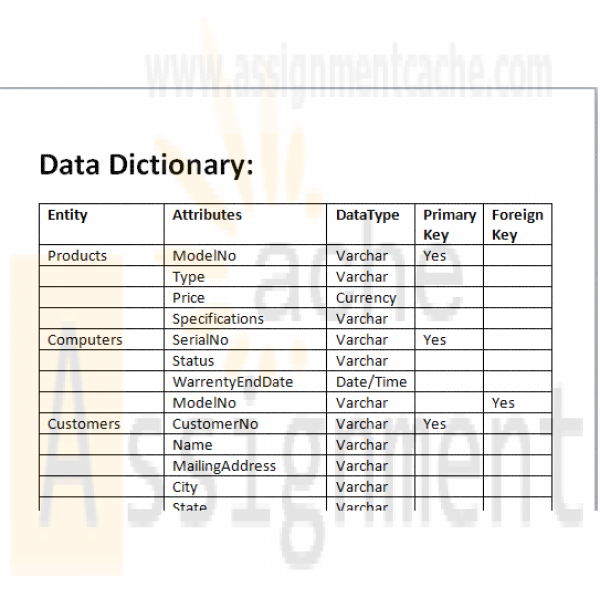 The data dictionary should include: the definition of each relation and attribute; the primary and foreign keys in each relation; attribute data types and lengths; and whether attributes are optional or required. Organize the data dictionary alphabetically by relation name. Part I deliverables will be evaluated based on the completeness and correctness/accuracy of the conceptual and logical data models, and of the supporting documentation (i.e., data dictionary, assumptions (if any)). If any of the deliverables are hand-drawn/written, your submission will not be graded. Submit the deliverables as one or more files. Include your name and title of the project on every page of the documents you submit. CIS 355 Term Project Part I For your term project, you are expected to design and implement a relational database to meet the requirements described in the PCI Warranty Call Center Case. 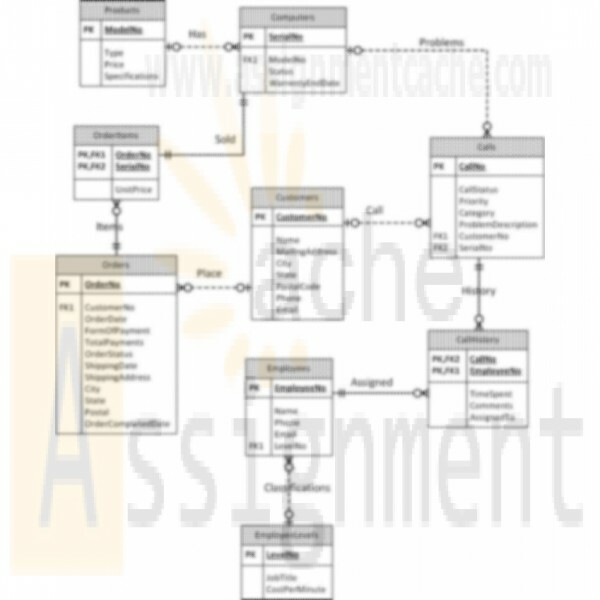 Deliverable Part I - Project Design Document This document should have the following components: 1. A conceptual ER model/diagram of PCI’s data requirements. The diagram should include all relevant entities, attributes and relationships. For each entity, specify the identifier (primary key). Specify relationship names and cardinality constraints. Indicate which attributes are required, composite, multi- valued, and/or derived (Note: by default, an attribute is assumed to be optional, simple, single-valued and not derived). Indicate which entities are associative. Follow consistent naming conventions for entities and attributes. Use modeling/diagramming software to create the ER Diagram. 2. A list of the normalized relations (the logical model) and their attributes. For each relation, primary and foreign keys should be clearly indicated. Note: Use the format that we will be discussing in class for presenting your logical model. 3. A list of assumptions (if any) made about the information requirements presented in the case. Note: the assumptions should be reasonable and should not contradict the facts of the case. 4. A data dictionary that defines the metadata for the logical model. The data dictionary should include: the definition of each relation and attribute; the primary and foreign keys in each relation; attribute data types and lengths; and whether attributes are optional or required. Organize the data dictionary alphabetically by relation name. 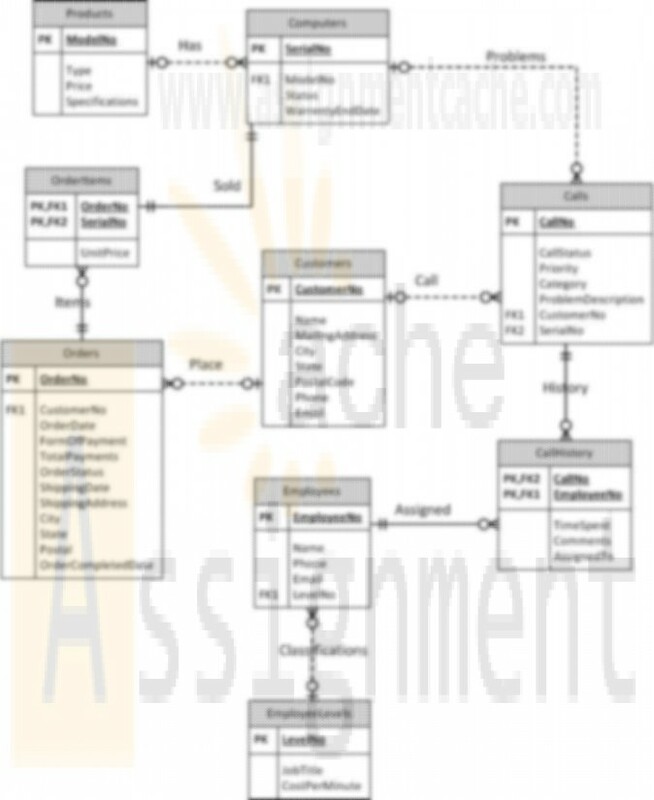 Assessment Part I deliverables will be evaluated based on the completeness and correctness/accuracy of the conceptual and logical data models, and of the supporting documentation (i.e., data dictionary, assumptions (if any)). If any of the deliverables are hand-drawn/written, your submission will not be graded. Submit the deliverables as one or more files. Include your name and title of the project on every page of the documents you submit.